The sturdiness of the wooden walls. The shouts of the stars in the quiet of the night. Hands held and hair braided. The warmth of a loving touch. Scrunched into a sleeping bag. The rush of taking a safe risk and the feeling of pride from accomplishing it. For all the years I have been going to camp, people have been attaching the phrase, “home away from home”, to my time there. And, each time someone said that something didn’t feel right. Instead, I would say, camp is less of my home away from home and more; my true home. Though, I do have many blessings including a loving family and home to live in, there is nowhere else that makes me feel at home like camp. Camp is a place that I love, both because of the physical place and the people and experiences that come with it. Camp has the ability to bring people together and make everyone feel that they are welcome and wanted. When I am at camp, the feeling of belonging warms me just as much as the sun does. It is a place where everyone can be their true self and be loved for it. They will be supported in all and anything they want to do. As a camper, camp helped me through so many difficult things and it continues to be a great source of strength for me. It shaped me into who I am, it challenged me and taught me countless new things. My hope for everyone is that they too get to experience the wonder of camp and the gifts the experience brings with it. Though this past summer was my first at Cairn, I have found all these fundamental truths to exist there as well. 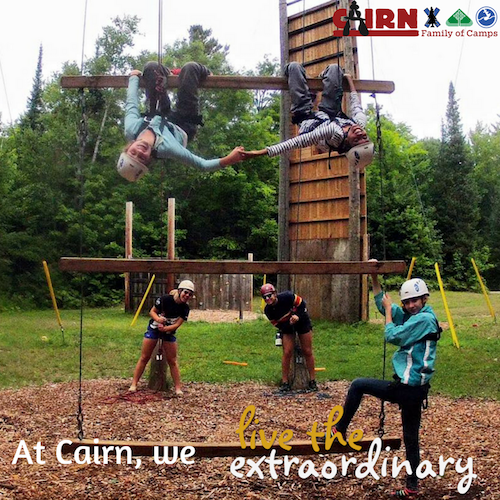 The new home I have found at Cairn is one that I am grateful and proud to be welcomed into.